Hello Reader! Love Asian Films? Then you should know Who Tsui Hark is than right? Check this news out, I’m Liking it. The Taking of Tiger Mountain is Tsui Hark’s upcoming film and from the trailer looks like it could be a good watch, and it looks like it’s a heart-felt drama with lots action and tons of snow. Check it out below and let me know. The Taking of Tiger Mountain stars – Zhang Hanyu, Lin Gengxin, Tong Liya and is due to hit big screens in China on December 24, 2014. 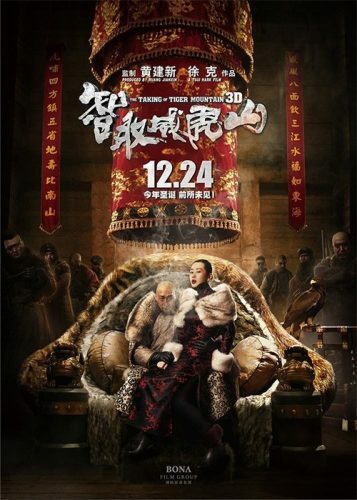 Plot: Adapted from the phenomenal Chinese novel “Tracks in the Snowy Forest” with the plot set in Northeastern China, this latest Tsui Hark’s 3D spy movie is a battle of wits between a small military unit and the ruthless heavy-armed bandits during the civil war era of 1940s.